What kind of "hunter" would kill a bear in its den??? Noted thanks for posting Simone .Why hunt bears or for that matter why hunt any animal.We all wish these mindless gun totin bastards could be satisfied with target shooting .To kill another living creature and derive pleasure from it is devilish .I don't believe in the theory of karma,or of evil coming back to us in this life,I have seen far too many contradictions.I wish it was true, these brutal gun lovers deserve heaps of evil heaped on them in this life. Yeah...big macho hunter with a gun...killing bears in their dens ? What kind of human being could do this ? No to hunting bears, or any other animals. This hideous bloodlust should be banned. Simone, congratulations on this victory! See, we do have an impact. To think that this even goes on is so appalling, and that people consider bears to be the dangerous ones in the human-bear relationship is maddening. How a gun-toting, trigger-happy moron, oops sorry, 'hunter' can actually want to claim victory over shooting a bear in his/her den is beyond me. What kind of perverted pleasure they get out of this sort of action is also beyond me, but then, I'm NOT a gun-toting, trigger-happy moron I'm glad to say!! why kills animals? got nothing better to do? Thanks Simone - great news - I live in Colorado. A small step in the right direction. 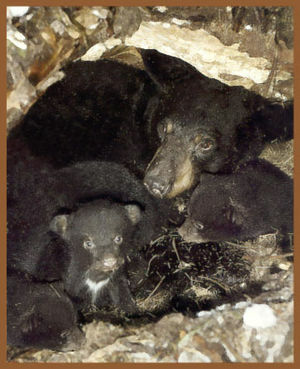 Why do people want to hunt the bears anyway, whether they are in their dens or not. All the bears want to do is live as nature intended and they should all be left in peace to do so.